Simulation Curriculum has released the latest version of its Starry Night software. In version 8 the company has released one of its most significant updates ever, with new functionality across the three available options –Pro Plus, Pro and Enthusiast. A new version 8 release of the Starry Night Complete Space & Astronomy Pack will be available soon. – Starry Night 8 supports all telescopes that are supported by Ascom. Plus, connect SkyFi 3 with Starry Night as well. – Accurate rendering of stars as 3D bodies with classification color, surface texture and relative radii. – Backup your data to secure cloud storage, sync it across Starry Night & SkySafari, and access it on LiveSky.com. – Web-delivered multimedia reveals the science of the solar system, stars, galaxies, and the known universe. 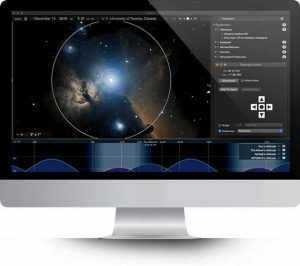 – High performance OpenGL graphics set the industry standard for excellence in astronomy software. All of these features are integrated in every level of Starry Night 8 with additional functionality such as telescope control offered in the Pro and Pro Plus versions. Each version also includes Starry Night Companion, a 192-page illustrated astronomy book offered in digital format and a new, comprehensive 146-page User’s Guide also offered in digital format.